Stonehill Drive is at high risk of fire. Our proximity to the National Forest puts us in the path of seasonal wildfires. 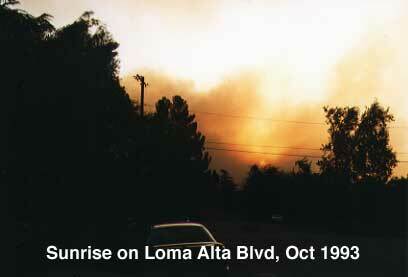 1993 was the last major fire in the area. It claimed many houses in the immediate vicinity. There were no houses lost on Stonehill Drive, due to the coordinated efforts of the residents. Dr. Dan Gollnick, who lives at the very top of the street has installed a fully equipped fire house on his property. Dr. Gollnick played a major roll in the fire fighting effort of 1993, but he did not do it alone. If you have not had a tour of the fire house, please contact him to arrange one. When the next fire comes, you will be glad you did. Though people can never fully protect their homes and adjacent wildlands against wildfires, you can take steps to reduce the risk. * Remove combustible vegetation from the vicinity of any structure. Thin out continuous tree and brush cover and remove dead limbs, fallen trees, leaves, twigs and evergreen tree cones within 30 feet of the structure to create a " safety zone of low fuel density all around the home" (NFPA). Likewise, prune trees branches to 10 feet above the ground and remove leaves and twigs from beneath trees, in the yard, on roofs, patios and landscaped shrubs. * Limit the number and density of landscaped vegetation and do not use highly flammable landscaping near structures. Maintain a greenbelt or noncombustible zone around the home; avoid using bark or wood chip mulch in the safety zone. * Stack firewood uphill at least 15 feet from a house. Fire risks increase when wooden decks, patios and woodpiles are placed close to structures or when flammable materials are stored near structures. * Be aware that roofs and walls made of untreated flammable materials such as wood shanks and shingles pose a significant fire threat. Wind­carried embers or the intense heat from a nearby fire can ignite such fuel sources. Fire does not need to "burn over" a structure for it to catch fire. * Clean roof and gutters. Remove pine needles and leaves to eliminate fuel sources. * Prepare for water shortages. Lack of piped water to protect against fire is a major problem in wildland/urban interface settings. To protect a structure, develop an external water supply, such as a small pond, well or pool, for fighting fires. Publications such as Planning for Water Supply and Distribution in the Wildland/Urban Interface (see references in this section) provide valuable information for preparation of homes and protection systems in the event of wildland fire. * Choose home location wisely. Building structures in canyons and on slopes increases the chances that those homes will be destroyed by wildfire. Canyons and slopes serve to channel fires up in elevation, similar to the way chimneys channel fireplace emissions. When upland slopes and canyons are selected for home sites, downhill or lower elevation areas should be clear of excess fuel, to add an additional element of protection. If a home is on the crest of a steep hill, thin the fuel sources at least 100 feet below the crest. * Mow tall grass and keep it to a maximum height of two inches within the home safety zone. Avoid tall grass around driveways, areas susceptible to ignition by automobile exhaust systems. * Inspect and clean chimneys regularly. Equip chimneys for woodburning heating units with spark arresters. * Avoid all outdoor burning to decrease the likelihood of fire ignition near a home structure. * Prevent mishaps with outdoor cooking grills by carefully maintaining the grill and using caution during grill use. * Have the right tools. Equip home with smoke detectors. Keep these tools in good working order and store hi an easily accessible area of the house.